Abstract: Sanger sequencing and real-time PCR methods have been the standard molecular methods in clinical diagnostics for decades. Deep sequencing or Next Generation Sequencing (NGS) technology revolutionized the field of genomics, transcriptomics and metagenomics and is now rapidly becoming a routine method in different areas of clinical diagnostics such virology, oncology, drug-resistance monitoring, non-invasive prenatal tests, microbiology, precision medicine, etc. 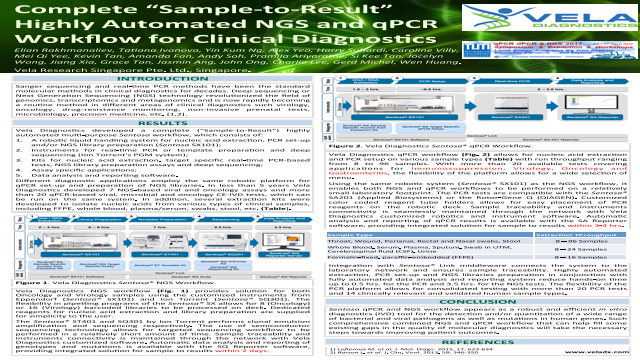 Vela Diagnostics developed complete (“Sample-to-Result”) highly automated multi-purpose Sentosa workflow, which consists of: 1) a robotic liquid handling system for nucleic acid extraction, PCR set-up and/or NGS library preparation (Sentosa SX101); 2) instruments for real-time PCR or template preparation and deep sequencing (Ion Torrent's PGM system); 3) kits for nucleic acid extraction, target specific real-time PCR-based tests, NGS library preparation assays and reagents for deep sequencing; 4) assay specific applications, and 5) data analysis and reporting software. Different diagnostic applications employ the same robotic platform for qPCR set-up and preparation of NGS libraries. In less than 5 years Vela Diagnostics developed 7 NGS-based viral and oncology assays and more than 20 qPCR-based viral, microbial and oncology CE-IVD tests, which can be run on the same system. In addition, several extraction kits were developed to isolate nucleic acids from various types of clinical samples, including FFPE, whole blood, plasma/serum, swabs, sputum, stool and urine.